How is the current political climate impacting your interactions with your students? A group of about 35 current and former Junior Faculty Teaching Fellows recently met at the Center for Teaching to discuss this question, looking for ways to promote dialog and learning that can help students navigate our highly polarized world. The participants teach classes across the university, within Peabody School of Education, the School of Engineering, the School of Nursing, and the range of disciplines within Arts & Science. We identified a number of common goals that these faculty find have a particular importance in our current climate. Develop students’ skill in evaluating arguments. In one class that specifically focuses on challenging social issues, the instructor asks students to focus on developing transferable skills that they can use to understand and evaluate any argument. The instructor and the students avoid expressing their own political perspective, but instead evaluate claims that are relevant to various social issues. As part of this process, the students may determine which of several competing claims is better supported, but the determination is made within the framework of the particular set of skills they develop as part of the course. Develop students’ ability to understand others’ perspectives. A faculty member in Physics talked about how empathy is the core of so much learning – being able to see things through another’s eyes and not reduce others to one issue or one point of contention. Others agreed, and offered specific examples of how this plays out in their classes. One Nursing faculty member asks students to take the perspective of the patients they will be dealing with and think about how specific policies and political climates might be perceived by those people, or how their health might be affected by policies. This serves to take the political debates discussed by various news outlets and contextualize them 1) in the discipline, and 2) in how they affect real individuals – a process that creates empathy. Another faculty member in Earth & Environmental Sciences talked about an assignment in which students summarize an issue and then have to write about the impact on two different stakeholders who have different perspectives. For example, they might have to describe (with evidence) the impact of expansion of offshore drilling on the local communities in terms of environmental impact, but also in terms of the impact on the livelihoods of the people who live in that community. The students then summarize their personal perspective on the issue and describe how an understanding of the science affects their perspective, helping the students to examine their personal beliefs in terms of whether they are based on evidence/fact or not. Develop students’ understanding of the discipline being studied—and the value it offers in creating and evaluating knowledge. One faculty member in English talked about how choosing works of art for a class—be they paintings, poems, or performances—is inherently political. Choices from the canon suggest one political perspective, while choices beyond the traditional canon suggest another. By talking with students about these decisions and how they reflect the political climate of various eras, the instructor helps students understand how we are, at any given time, making choices that reflect the history of a discipline and that shape the future of the discipline. By discussing how our understanding of what is “good” in a particular discipline shifts, these instructors empower their students to think critically in a way that is deeply embedded within the discipline and can help them understand some of the conflict that accompanies cultural change. Build students’ ability to understand policy, politics, and controversy. For example, a Physics faculty member asserted that courses should help students understand some of the things they see in the news. Rather just talking about how light works and hoping that students put it together, the instructor goes one step further to explain how those physical properties of light create the greenhouse effect to help students be more informed consumers of news about climate change. These goals are of perennial importance in colleges and universities; many are enshrined in core curricula across the country. They have particular importance in a time when coupling an ability to understand perspectives across political divides with the ability to critically evaluate claims is the path we have to move forward in a productive way. The group also discussed a number of practices that they use to help them reach these goals. Developing guidelines to promote civility. Several faculty members said that they encourage their students to come up with a set of guidelines grounded in civility and respect that would structure subsequent discussions and other student interactions in class. In one course, this set of student-created guidelines is made visible and accessible in every class meeting, so students can reference it as needed. Defamiliarizing the issue. In some courses, the questions that are discussed are considered “closed” questions, where modern U.S. society (and the instructor) endorses a particular point of view. For example, protection of child labor and human slavery are closed questions for our society. In many cases, however, these closed questions are specific cases of a perennial issue that remains unsettled in a larger sense. If the history of the specific case is unfamiliar to the students, that defamiliarization can allow them to grapple with the forces and arguments that shaped the case—and prepare them to identify those forces and arguments when they see other cases of the perennial, larger issue. Using debates. Several instructors talked about using classroom debates. Some of these faculty members encourage students to choose a position to argue that does not align with their own perspectives as a way to: research and understand a position that conflicts with their own, learn how to develop and defend an argument, and examine and better understand their own perspective. Other instructors simply tell their students to know the opposing argument as well or better than they know their own—and may play devil’s advocate to help the students reach this bar. Using simulations. Several faculty members talked about using simulations or role plays to get students to consider perspectives other than their own, and even to be able to defend in discipline-specific ways the validity of the other’s arguments. Letting students lead. One faculty member creates space for student-led discussions in which students would prepare to be facilitators, thus encouraging the students to plan for how to bring different voices into the conversation. This practice leads to students creating meaningful opportunities for interaction amongst themselves and helps them become more aware of how to involve their peers, even if those peers had different perspectives than their own. Other faculty members talked about encouraging out-of-class, student-led groups where people with distinct viewpoints could get to know each other’s beliefs, fears, and concerns. Teaching the entire scientific process. Scientists widely accept that climate change has anthropogenic causes and that vaccination is the safest choice for non-allergic individuals, and pretending otherwise while teaching would be disingenuous. Nonetheless, these topics—considered closed within the scientific community—are open questions for many elected officials and perhaps for some of our students. One way to help students understand why these questions are considered closed for most scientists may be to help students understand more about the scientific process (and truth claims more generally). Naomi Oreskes, Harvard historian of science and author of Merchants of Doubt, suggests that Americans have fundamental misunderstandings about scientific inquiry. We are taught that we should trust science because the scientific method leads to measurable results and hard facts, but Oreskes argues that the real power lies in the ongoing scrutiny by the scientific community in a process that sociologist Robert Merton termed organized skepticism. Understanding how this scrutiny occurs, how it helps shape the growth of knowledge, and how it sometimes goes wrong can be enormously valuable in helping our students become informed citizens. Making an informed decision about whether to reveal one’s own perspective. When faced with the decision of whether or not to reveal their own perspectives in the classroom, some instructors felt that it was important not to influence their students’ learning experience with their own personal perspective, but rather let the development of discipline-based knowledge and ways of thinking shape student perspectives. Some instructors, however, felt that the revelation of their own perspectives was necessary or an inevitability, either by the nature of their course content or by their visible identities in the classroom. These instructors voiced the need for transparency and intentionality in such courses, from upfront class discussions to the structure of the course content. One instructor mentioned that their discipline is already imbued with certain perspectives and that even their syllabus, from choices of readings to assignment structures, communicated certain messages and perspectives. Transparency was paramount to the course’s success. For this reason, students were very aware from the beginning of the course where it was headed and from where the instructor was coming. Another instructor mentioned that their very physical presence communicated some specific power dynamics, which were augmented by the course content. To ignore those dynamics and not acknowledge the instructor’s own perspectives and expertise would undermine students’ ability to engage and learn in the course, as well as the instructor’s authority in the classroom. Ultimately, the choice should be thoughtful and informed by the context of the course. Trusting our students. Instructors talked about how important it is to trust our students to be thoughtful individuals who are allies in their own education. Some instructors noted that one element of that trust is to be rigorous in our thinking, helping our students identify false equivalencies. That is, competing claims are not necessarily made on equal ground; the loss of the right to discriminate is not equivalent to active discrimination, and helping our students learn to identify these false equivalencies is part of our role as responsible instructors. The CFT’s Joe Bandy has a blog post offering other helpful suggestions: Teaching in Response to the Election. 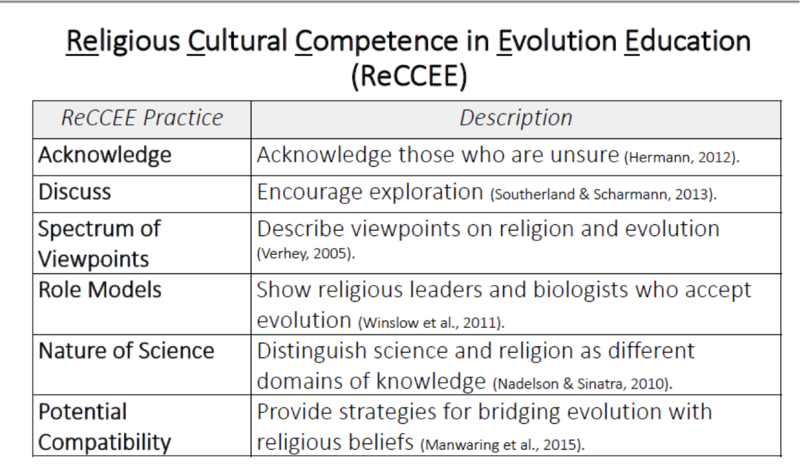 Sara Brownell and Elizabeth Barnes used ideas from the cultural competence literature to design instruction to help religious students understand evolution, resulting in a 50% decrease in the number of students who perceive a conflict between their religious beliefs and evolution (http://abt.ucpress.edu/content/79/2/104#T2) . They used six specific practices that are shown in the table at right. While their work focuses on teaching evolution, the practices they use may translate to other issues where perceived conflicts between students’ identity and the subject matter prevent learning. Further, the linked paper describes a two week module, but they have achieved similar results with a condensed, 10-minute introduction (under review). In tumultuous times, students and faculty are likely to find disagreement when discussing public issues, from climate change to poverty, from racial inequality to immigration. These and many other issues are the subject of great social debate and our students may have many deeply held emotions and identifications with one or more perspectives. In these contexts, debate and conflict is likely. Ongoing discussions can help instructors move forward in their efforts to build civil communicative processes into their teaching so that students can conflict in ways that are respectful and conducive to critical thinking. Contact the CFT to schedule an individual consult or a group conversation that can help you with these efforts.